On a personal note I was just about to start the third and final year of my degree so was no doubt getting ready to knuckle down to some hard studying!! But not too busy to commit these three classic long-running topical comedy shows to tape. 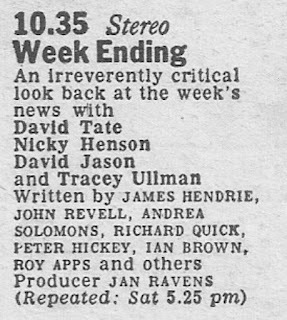 Yes, this is a rare opportunity to listen to The News Huddlines, The News Quiz and Week Ending all from the same week in 1982. 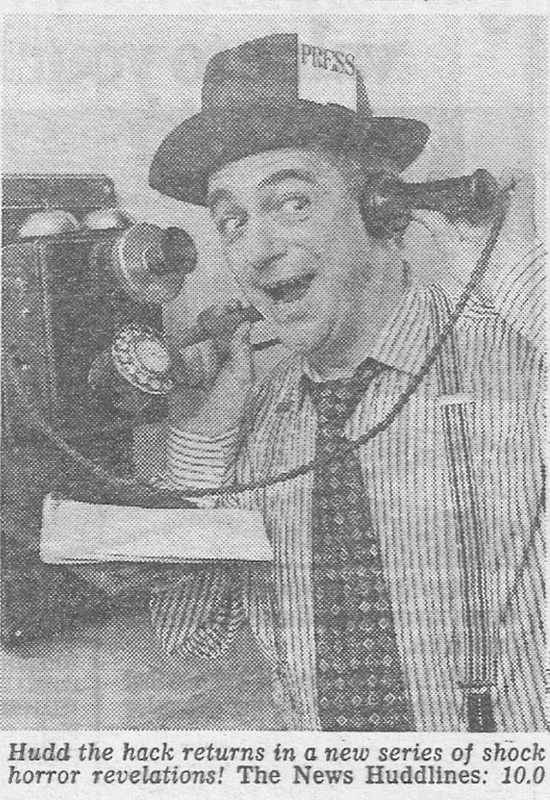 Firstly a typically lively Thursday night edition of The News Huddlines from 23 September. With Roy Hudd is Chris Emmett and Alison Steadman. 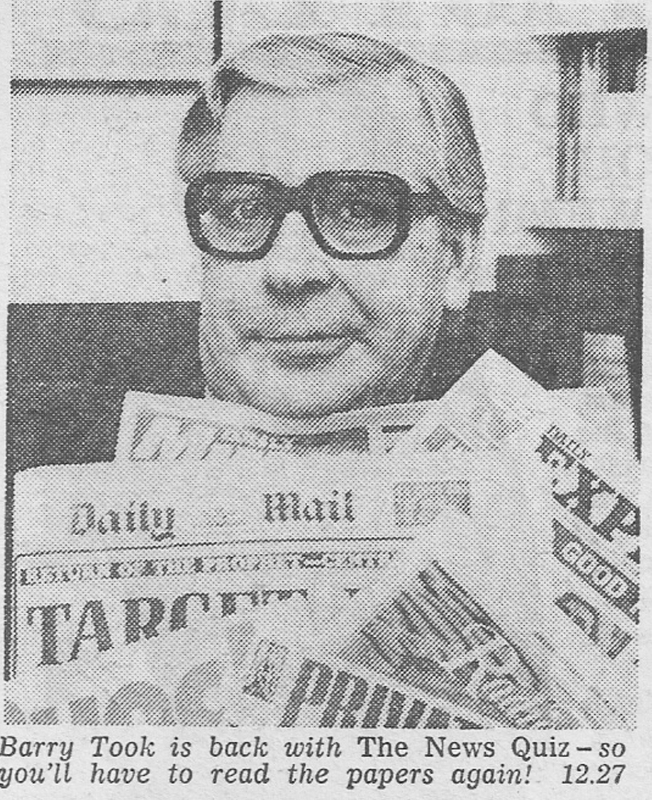 There'll be more about The News Huddlines next month. Amazingly even six years after resigning as PM, the team still wring some humour out of Harold Wilson, but then Chris did a great Wilson voice. A highlight is Alison's reading of Di's Diary. 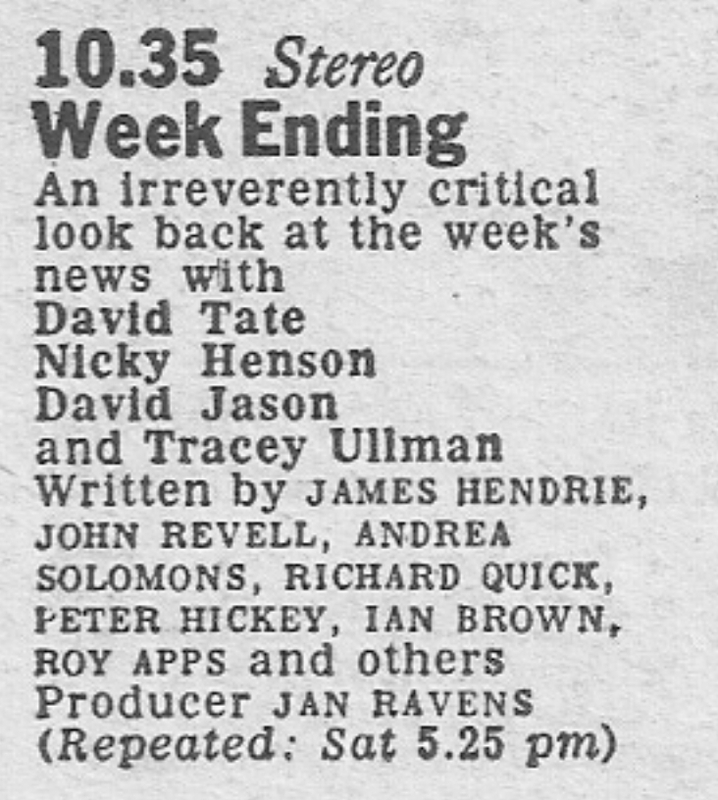 Next up is Week Ending from Friday 24 September with David Jason, David Tate, Nicky Henson and Tracy Ullman. Subjects for comedy include the TUC day of action, the Middle East, unemployment and a certain Royal Wedding. There's that old standby of comic observations in the David Attenborough style. In all honesty there's little here that raises a smile, not sure if it's the passage of time or that this is a duff edition. Finally the Saturday lunchtime edition of The News Quiz. In the chair is Barry Took. Taking part are Russell Davies, Hunter Davies, Sue Cook and, here amply demonstrating the comedy value that he imbued, Alan Coren. Reading the headlines, complete with accents, is Peter Donaldson. Note that the panel totally fail to answer what Took acknowledges as a "difficult question". Anyone checking the BBC Genome listing for this edition of The News Quiz will spot that Stan McMurtry was billed to appear rather than Hunter Davies. I've submitted this information to the Genome team.